Thereafter will follow what very anxious broadcasters have described as a vehicular apocalypse as a million people all get in their cars and try to return on the three roads leading back to town. Many foresee a Donner Party hellscape engulfing the poor, helpless meat sacks awaiting their fate there in the parking lot of Interstate 5. It may therefore be my final post, in which case, goodbye. Society did not collapse. The roads around Portland were a tad clogged for a period of the day, but nothing extraordinary. As to the event itself--a bit more could be said about that. 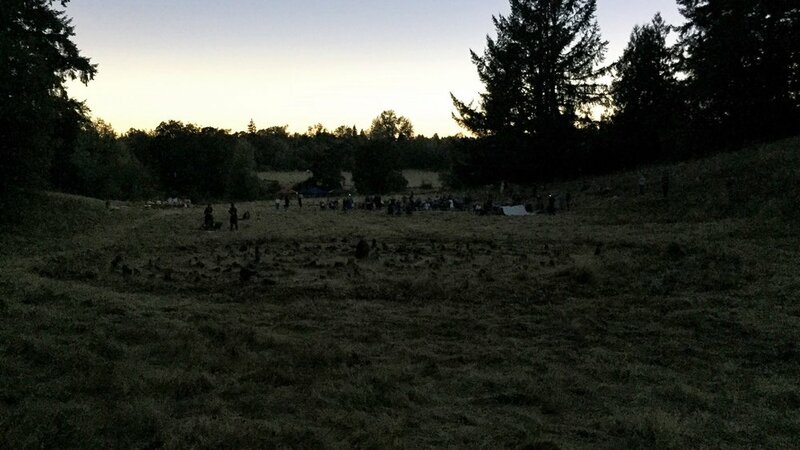 I spent the night in Aurora, OR, at the northern edge of the path of totality. The day dawned a bit misty but cloud-free and we had a leisurely morning before settling down to watch the spectacle. Early on, there was little to see except the little bite-mark the moon left in the sun as it slowly sidled in front of us. Nothing much changed, and you would only have known an eclipse was happening with the special glasses that allowed you to look directly at the sun. As the moon became more and more intrusive, subtle changes began happening around us. The quality of light changed, from that fat, saturated yellow of summer to a thinner, bluish winter hue. The temperature began dropping, too, but not until much of the sun was blocked. One lone, confused cricket started playing. The bowl of sky, which once ran from cobalt overhead to baby blue at the horizon, lost much of its color and became a faded pastel blue with a subtler gradient. My phone kept adjusting for light, so these don't capture the full difference in light--but they hint at it. It was only near the end that the big changes started happening. Darkness fell, but not like night. It was like twilight on a different planet with a silvery sun. If anyone's seen old movies for film shot day-for-night, the impression was something like that. At dusk, the sun's light is filtered through increasing layers of atmosphere and gets warmer and more golden. Under an eclipse, the light just bleeds away. The sun is unbelievably strong. It was so bright that my camera never captured anything but a circular form, even when it was the barest sliver. The amount of light a tiny crescent provides is likewise shocking--the dimming light was an odd, otherworldly sight, but only at totality would one have needed headlights. Even with those impressive glasses--they allow no light through except the sun--my eyes ached in the brightness. Throughout the process, we marveled at the sun's mighty force. Totality. The horizon was nowhere near as bright as this photo depicts it.